Karen instantly fell in love with High Hedgefield House, a spacious Grade II Listed Georgian manor house which is steeped in local history and situated in a secluded yet highly accessible half-acre plot on the edge of Ryton village. The detached property’s period charm and quirky features coupled with an abundance of beautifully maintained outdoor garden space fulfilled everything Karen had been seeking for her family home. 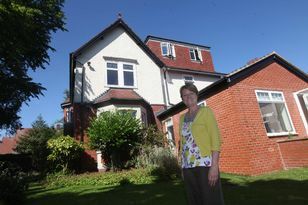 “It’s a home that lends itself to outdoor living, family and pets,” says Karen, a regional director for a group of care homes. She explains: “For anyone who wants lots of space andwants to be only 10 minutes from the Metrocentre, the A1 and Newcastle city centre, then this is the perfect house for them. “It’s actually two houses for the price of one because there’s an attached, self-contained coach house which has a rental income. “There’s also a paddock extending to just under an acre, which is a really unusual feature for a house here, so it would be perfect for anyone with a horse or a pony. stationed a pit manager there. The original coach house is now a two-storey residence, ideal for independent relatives or a rental opportunity, and has an entrance lobby, open plan lounge through to kitchen, toilet, spacious first floor landing area, large bedroom and bathroom. The main manor house features a ground floor entrance lobby, entrance hall, lounge, dining room, living room, kitchen/breakfast room, cellar, larder, utility room, inner hall and cloakroom and toilet. To the first floor is a master bedroom with en suite, a second en suite bedroom, three further bedrooms and a bathroom. “We’ve done virtually everything to it from the bottom up,” says Karen, 50. “When we started renovating we found some of the original features like part of a bread oven that was left over and we’ve pulled out all of the inglenook fireplaces that were all covered up. There is also a double garage which can house four cars and plenty of potential to extend the property further if desired. Karen said: “I have absolutely adored living here. It’s been such a great house for entertaining. In summer, everyone would come to us for barbecues and at Christmas we’ve always had family parties because we’ve got such a huge dinig room. “I’ve even held a summer fate for charity and had a disco in the garden too. I’ll be very sad to leave it but its just too big now so I want to downsize. It’s a very special house that pulls you in. High Hedgefield House, in Ryton, is for sale at around £699,950, through Pattinson, tel: 0191 4886464.